The joy of life with a child is, of course, immeasurable in its challenges, optimistic excitement, and its milestones. Life with Christopher has been all of these things and more. 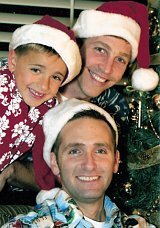 I decided to adopt a son after years of living an enjoyable and fulfilling life as a single gay man, because I had known since I was young that I wanted a family. Not yet having found Mr. Right, I decided to move ahead with my vision of a family with the hopes of meeting the right man somewhere down the road. I’d always heard people say that they wanted to wait until they were “ready” before having a child, and I always thought, “How can anyone be truly ready?” I took a deep breath, jumped, and adopted as a single man. I knew I wanted to adopt because there are so many children in the world that need love; it didn’t seem right to try to bring a new life into the world through surrogacy. A private attorney said it could take up to three years, if ever, to find a birth mother to choose me, a single gay man. Finally, after almost a year of disappointment with San Diego County Adoptions, a friend suggested international adoption from Ukraine. Within a few months my mom and I were on a plane to Lutsk, nervous, excited and uncertain of what to expect. My fears and concerns were many, but my resolve was strong. After choosing to adopt this way, I began to wonder what I could expect in the future because of my lack of knowledge of the birth parents. I knew that things could come up after being with an adopted child for a while, but I realized that it’s part of my role as parent to be there for the unexpected. Once in Ukraine I hired a driver and a translator since I don’t speak the language. I was forced to trust people that I did not know and had no reason to trust. Considering that the majority of the babies I was shown by the adoption agency had health issues, I began to wonder if the people I was working with were trying to steer me into accepting a child that I may not be able to handle. It seemed they had their own ideas regarding whom they wanted me to adopt. I was shown thousands of pictures of children: some HIV positive, some with Down’s syndrome, most malnourished and neglected. It seemed that I was being steered to take a special needs child, but being honest with myself I knew that was not the experience I was looking for. After seven hours of looking over books of unwanted faces—I was kicked out of the office twice by a frustrated social worker who told me I needed to lower my standards–I found Christopher, the only child with a smile on his face in all those pictures. The process then moved rapidly, and after nine days of anxious uncertainty and holding my breath, my mom, Christopher and I left Ukraine for home. I had been in Ukraine for ten days, a far shorter time than I expected, but that time seemed insignificant in the wake of the realization that Christopher and I were now a family and I was a daddy. Just over a year later, our family grew again when I met Randy. He brought to our family the talents and strengths I never knew I lacked until faced with the complexities of being a parent. We have grown together, all three of us, into a tight unit, Daddy, Papa and Christopher, and we hope to add to our family with another adoption soon. I knew I wanted to adopt because there are so many children in the world that need love; it didn’t seem right to try to bring a new life into the world through surrogacy.